My students often want to learn how I paint the trees in my landscape paintings. 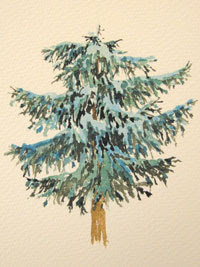 Here is a quick demonstration on how to paint a pine tree. First of all, it's important to plan ahead with thumbnail sketches and drawings to understand the way the tree grows and the different values and colors it portrays. 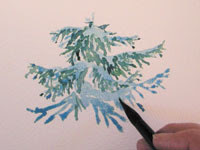 Then I start the tree with a number 10 round brush, or larger. 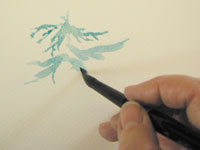 I use very wet paint and stroke the lightest values in the direction the branches flow. Observation is very important! This first wash was accomplished with a combination of cerulean blue and perylene green. I build the bulk of the tree , trying to allow room between the branches for the background and additional values. I don't want it to look like a big triangle! 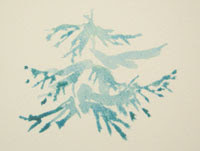 I like the look of varying the width and length of the strokes to portray the way the branches hang. In general, on a pine tree, the branches will be thicker, longer and more dense at the bottom of the tree. Next, I begin to add darker values to create the illusion of shadow and depth. I have to remember to paint around some of the first, lighter, layer and sometimes to paint right on top of it. Layering the paint this way creates more variation in the colors. Again the quality of the stroke is very important. The stroke must represent the way the branches hang or sway. Some pines bows swing out and up, others sort of hang down. This wash was perylene green with a touch of permanent sap green. I continue with layers of color, using a little less each time. This shadow area was created with variations of perylene green, and a combination of permanent sap green with a bit of burnt sienna. There are so many beautiful green pigments to try, and thousands of colors can be created by physically mixing them! I think that is half the fun. The final touches are added sparingly. The trunk is added by touching it in the blank areas that show between the branches, and then at the bottom. 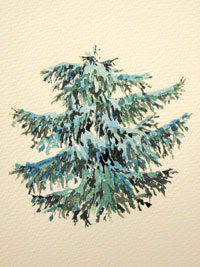 The branches of an evergreen are usually well-hidden under the foilage. So I stick to adding the vertical trunk, and only a little where I know it will show. Voila! My tree. Now if this were winter, I would paint around the white snow, but since I am really looking for spring, I will stick to the green! This is a good example of how my classes work. We usually work on a project together. I demonstrate one step at a time, and then the students practice. We work on techniques, washes, brush work, etc. using real projects to see how the techniques are applied to a painting. Lots of fun! I have a booklet that describes how to paint several different kinds of trees in detail, with lots of photo references, a sample project drawing to trace, and lots of information on how to paint trees in watercolor. Visit my etsy shop to view and purchase.